It looks like the Galaxy Nexus will be soon available in Sprint’s LTE 4G network. 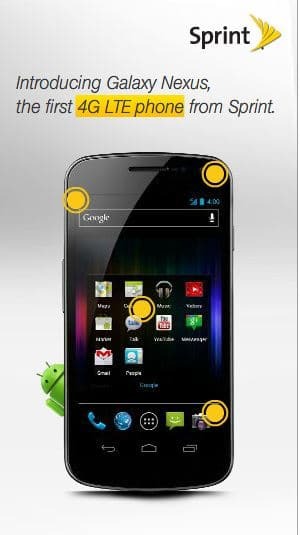 Sprint is advertising the Galaxy Nexus on a CNET page, introducing it as the first 4G LTE phone from Sprint. This is great news for Android fanboys, now they can start feeling sorry for people who recently bought an iPhone from Sprint. They won’t be enjoying this 4.65-inch HD Super AMOLED display device with Android 4.0 and a 1.5GHz dual-core processor. And enjoy the unlimited data in 4G LTE not that crappy speed iPhone owners are receiving from Sprint which is less than a 1/Mbps.